New T-Shirts & More Points: Hello June! 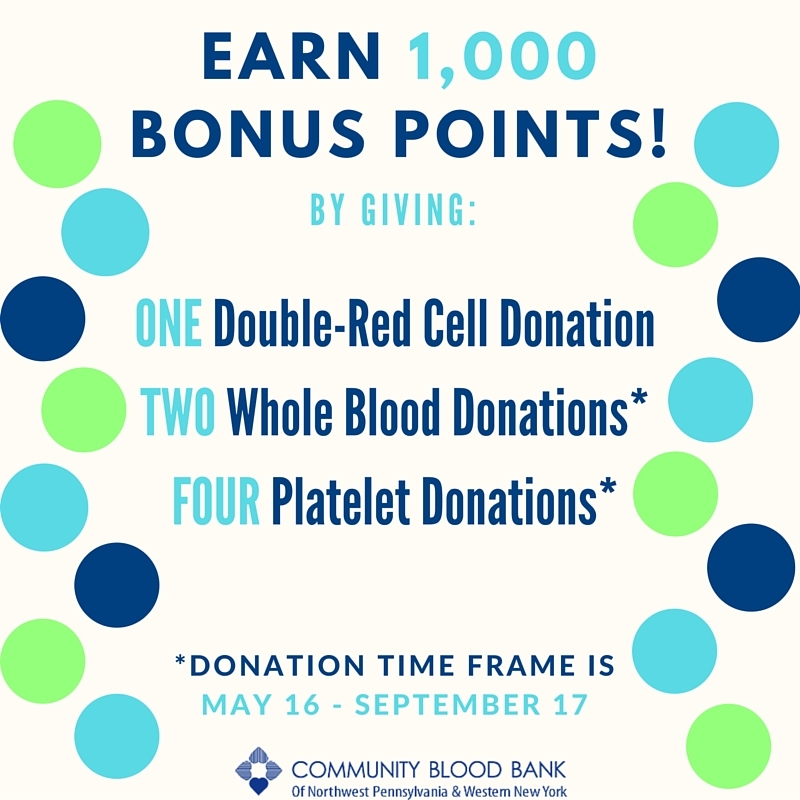 We’re continuing the celebration all month long with two different promotions for our donors! In addition to the point promotion, all month long every donor will receive a limited edition t-shirt celebrating our 50th anniversary! Want to know the best part? We heard your wishes for colored shirts and are happy to deliver! These shirts are a great shade of blue, with a red and white logo on them. They’ll be the perfect addition to your Fourth of July outfit next month! As you know by now, the 1,000 Point Promotion continues until September 17. Don’t miss your chance to receive a $10 gift card! New gift cards are being added to the point store weekly. A Friend for Gus: Only 8 Days Left! As many of you know by now, this walk allows us to raise money which will be put toward the purchase of a second bloodmobile. This second bloodmobile (a friend for Gus, our current bloodmobile) will allow us to better serve our donors by giving us the ability to hold more mobile drives than what our current resources allow. As a final reminder, once you’ve registered to walk, if you raise $20 you’ll receive a t-shirt from CBB, if you raise $30 you’ll receive a t-shirt from Highmark in addition to the t-shirt from us! And the first 100 walkers will receive a reusable water bottle from CBB! Oh, and did we mention that Highmark is giving away prizes too? They announced their prize list in April, and we have to say, this year’s prizes are pretty cool! They range from a bluetooth speaker, to a Roku streaming stick, various Apple products, two different types of Fitbits and more! For every $50 a registered walker raises/donates, you’ll be given a chance to win one of these prizes from Highmark! So let’s tally this up. If you register to walk and raise at least $50 you’ll receive a water bottle, two t-shirts, and a raffle ticket to win one of Highmark’s big prizes! That’s a lot of goodies! Don’t forget to tell your friends, family and coworkers about the walk. The more the merrier on walk day, we hope to see you there! As many of our long time donors know, the summer months can be particularly difficult for the blood supply. With an increased need and and overall decrease in donations, it’s a perfect storm that results in critical shortages. We’re hoping to avoid that this summer, so please make sure you’ve opted in for texting, emails, and phone calls! Our partner hospitals, their patients, and our communities are relying on our ability to quickly reach selfless donors like you in order to keep the local blood supply stable. If you’ve forgotten how to opt in for text messages, it’s simple. Just text the word BLOOD to 444999. You can opt in for other forms of communication using the communication tab on your donor portal. We still have dates available for GR8 GIVERS in June! To reserve your date contact Sara Macerata, Donor Services Assistant, at smacerata@fourhearts.org OR at (814) 456-4206. As a reminder, GR8 GIVERS takes place year round, and groups can consist of family, friends, co-workers, neighbors, classmates or members of your church. Once your group of 8 (although more are always welcome!) have signed in and donated during your selected week, you’ll automatically be entered into a drawing for a $50 gift card for breakfast or lunch for your group! Congratulations to Ralph who won the $100 gift card in April! Interested in winning? One winner is selected at random from our point store drawing each month, you can enter as many times as you’d like each month OR you can redeem your points for something tangible like a coffee mug, t-shirt, or gift card. Your points are yours to use as you’d like, happy shopping! As we mentioned, more gift cards are being added weekly for the duration of the 1,000 point promotion. The most recented addition are $10 Amazon gift cards! Don’t forget to shop through AmazonSmile, which allows you to shop Amazon like you normally would, with one difference: .5% of the price of your purchase will be donated to CBB! Getting started is simple. Just log in to your Amazon account using this link: https://smile.amazon.com/ch/25-1181389 and start shopping!